This week Mel was mind-blown by this simple thing she’d be doing wrong up until now. Mel had always used bobby-pins in her hair, the wrong way up! 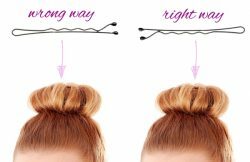 She learnt that the bumpy side of the bobby pin actually goes against your head, and this provides more grip and longer lasting hair styles! Now, she does admit that she might’ve been a bit slow to learn this one. When she shared this news with Producer Rachel, Rachel admitted she’d seen this on Facebook a few months ago. Mel doesn’t have any social media so she gets these socially-shared news a little later than everyone else but she was stoked none the less! plastic surgeons, biocompatible frame and stem cells Stelarc now has a 3rd ear on fire forearm. Originally he wanted the ear behind his own natural ear but this didn’t work out. Stelarc’s aim is to insert a wireless microphone that will let interested parties around the world tune into Stelarc’s days, eavesdropping at any and all times—privacy be gone. Have a listen to the full Show and Tell chat and Mel and Jeziel’s reactions to each other’s news below. Across the Ditch: Robbers steal $100K of what?